There are certain foods you can eat that will help the ‘happy’ chemicals in your brain to keep flowing. Two key players are the neurotransmitters dopamine and serotonin, known to most as the ‘happy hormone’. Low levels of these chemicals can cause tiredness and lowered mood, while a lack of Omega-3 can also lead to fatigue and mood swings. So as they said in Life of Brian, always look on the bright side of life…and here’s the mood-boosting foods to eat to help you along. 1. Salmon: The Omega-3 fatty acids found in salmon have antidepressant effects. Try yours with scrambled eggs or avocado at breakfast. 2. 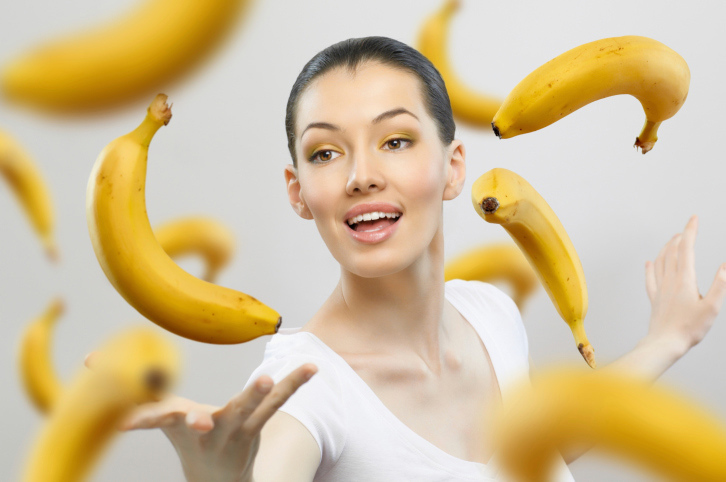 Bananas: The Vitamin B6 found in bananas converts tryptophan into serotonin, the mood-lifting hormone. This way, you will not only feel chirpier, you’ll also get a better night’s sleep. 3. Oats: Oats have a low glycaemic index (GI), as they slowly release energy into our bloodstream rather than a quick rush that soon drops. This helps to keep your blood sugar and mood stable. 4. Spinach and kale: Eating leafy green vegetables – such as spinach and kale – will help keep up your levels of mood-boosting B vitamins like folate, vitamins B3, B6 and B12. Make a raw spinach salad – or add kale to stir-fries and soups. 5. Poultry: Chicken and turkey are very rich in tyrosine, an amino acid that helps the body cope with stress more efficiently. Make tomorrow’s sandwich a chicken salad. 6. Green tea: Green tea is full of antioxidants, amino acids and L-theanine, known for reducing stress and anxiety while improving mood. If consumed on a regular basis, green tea can boost feelings of overall well-being. For a healthier, longer life doctors recommend one cup of green tea a day! Tips courtesy of Nutritionist Jo Travers www.thelondonnutritionist.co.uk and Gatwick Airport. I’m very happy with 5 out of the 6. I will eat all of the foods but I will leave the green tea, not my cuppa! I also have 5 out of 6. Not tried green tea but I think I’ll give it a go. I am already doing 5 of the 6 as I cannot eat salmon. You can get green tea tablets from the health food stores which is what I get. A lot easier to digest.